Those parts of Northern Canada (dark green areas within the red line) considered to be part of the Arctic Region according to average temperature in the warmest month. Political definition of Northern Canada - the "territories" of Canada Barren Grounds and tundra are shown in light blue, and the taiga and boreal forest in dark blue. The north is divided ethnographically into the Inuit living predominately in the "Arctic" region and the First Nations living predominately in the "Subarctic". The "far north" is synonymous with the areas north of the tree line: the Barren Grounds and tundra. This area is home to the various sub-groups of the Inuit, a people unrelated to other Aboriginal peoples in Canada. These are people who have traditionally relied mostly on hunting marine mammals and caribou, mainly barren-ground caribou, as well as fish and migratory birds. This area was somewhat involved in the fur trade, but was more influenced by the whaling industry. This area was not part of the early 20th century treaty process and aboriginal title to the land has been acknowledged by the Canadian government with the creation of autonomous territories instead of the Indian reserves of further south. Very few non-Aboriginal people have settled in these areas, and the residents of the far north represent less than 1% of Canada's total population. The far north is also often broken into west and eastern halves. The eastern Arctic which means the self-governing territory of Nunavut (much of which is in the true Arctic, being north of the Arctic Circle); Nunavik, an autonomous part of the province of Quebec; Nunatsiavut, an autonomous part of the province of Newfoundland and Labrador; and perhaps a few parts of the Hudson Bay coast of Ontario and Manitoba. The western Arctic is the northernmost portion of the Northwest Territories (roughly Inuvik Region) and a small part of Yukon, together called the Inuvialuit Settlement Region. Since 1925, Canada has claimed the portion of the Arctic between 60°W and 141°W longitude, extending all the way north to the North Pole: all islands in the Canadian Arctic Archipelago and Herschel, off the Yukon coast, form part of the region, are Canadian territory and the territorial waters claimed by Canada surround these islands. Views of territorial claims in this region are complicated by disagreements on legal principles. Canada and the Soviet Union/Russia have long claimed that their territory extends according to the sector principle to the North Pole. The United States does not accept the sector principle and does not make a sector claim based on its Alaskan Arctic coast. Claims that undersea geographic features are extensions of a country's continental shelf are also used to support claims; for example the Denmark/Greenland claim on territory to the North Pole, some of which is disputed by Canada. Foreign ships, both civilian and military, are allowed the right of innocent passage through the territorial waters of a littoral state subject to conditions in the United Nations Convention on the Law of the Sea. The right of innocent passage is not allowed, however, in internal waters, which are enclosed bodies of water or waters landward of a chain of islands. Disagreements about the sector principle or extension of territory to the North Pole and about the definition of internal waters in the Arctic lie behind differences in territorial claims in the Arctic. This claim is recognized by most countries with some exceptions, including the United States; Denmark, Russia, and Norway have made claims similar to those of Canada in the Arctic and are opposed by the European Union and the U.S. This is especially important with the Northwest Passage. Canada asserts control of this passage as part of the Canadian Internal Waters because it is within 20 km (12 mi) of Canadian islands; the U.S. claims that it is in international waters. Today ice and freezing temperatures make this a minor issue, but climate change may make the passage more accessible to shipping, something that concerns the Canadian government and inhabitants of the environmentally sensitive region. Under the Köppen climate classification, much of Northern Canada has a subarctic climate, with a tundra climate in most of the Canadian Arctic Archipelago and an Ice cap climate in Arctic Cordillera. For more than half of the year, much of Northern Canada is snow and ice-covered, with some limited moderation by the relatively warmer waters in coastal areas with temperatures generally remaining below the freezing mark from October to May. During the coldest 3 months, mean monthly temperatures range from −20 °F (−29 °C) in the southern sections to −30 °F (−34 °C) in the northern sections although temperatures can go down to −55 to −60 °F (−48 to −51 °C). Owing to the dry cold air prevalent throughout most of the region, snowfall is often light in nature. During the short summers, much of Northern Canada is snow free, except for the Arctic Cordillera which remains covered with snow and ice throughout the year. In the summer months, temperatures average below 45 °F (7.2 °C) and may occasionally exceed 65 °F (18.3 °C). Most of the rainfall accumulated occurs in the summer months, ranging from 1 to 2 inches (3 to 5 cm) in the northernmost islands to 7 inches (18 cm) at the southern end of Baffin Island. 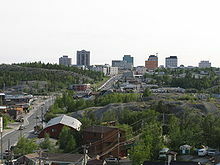 Skyline of Yellowknife, Northwest Territories. Parts of the north have recently boomed due to the amount of natural resources and a population increase in cities. ^ a b "Population and dwelling counts, for Canada, provinces and territories, 2016 and 2011 censuses – 100% data". Statistics Canada. 2017-02-08. Retrieved 2017-02-08. ^ "Territorial Evolution, 1927". March 18, 2009. Archived from the original on May 9, 2012. ^ Paikin, Zach. "Canada: The Arctic Middle Man" Maritime Executive, 21 August 2014. Accessed: 11 September 2014. ^ Peel, M. C.; Finlayson, B. L.; McMahon, T. A. (2007). "Updated world map of the Köppen–Geiger climate classification" (PDF). Hydrol. Earth Syst. Sci. 11 (5): 1633–1644. doi:10.5194/hess-11-1633-2007. ISSN 1027-5606. ^ a b c d e f g Canada Year Book 1967, p. 57. ^ "Land and freshwater area, by province and territory". www12.statcan.gc.ca. Statistics Canada. 1 February 2005. Archived from the original on 2011-05-24. ^ Government of Canada, Statistics Canada (8 February 2017). "Population and Dwelling Count Highlight Tables, 2016 Census". www12.statcan.gc.ca. ^ a b Government of Canada, Statistics Canada. "Population and dwelling counts, for Canada, provinces and territories, 2011 and 2006 censuses". www12.statcan.gc.ca. ^ a b c Government of Canada, Statistics Canada (15 January 2008). "Statistics Canada: 2006 Aboriginal Population Profile". www12.statcan.gc.ca. ^ a b Government of Canada, Statistics Canada (15 January 2008). "Statistics Canada: 2006 Aboriginal Population Profile". www12.statcan.gc.ca. ^ Sharanya, Sumith (2018-12-13). "14 Best Places to go to Canada | Victoria - Whistler - Quebec City". The best informative topics from around the world. Retrieved 2018-12-30. ^ "Census Profile, 2016 Census: Whitehorse, City [Census subdivision], Yukon and Yukon [Territory]". www12.statcan.gc.ca. Statistics Canada. February 15, 2019. ^ "Census Profile, 2016 Census: Yellowknife, City [Census subdivision], Northwest Territories and Yellowknife [Population centre], Northwest Territories". www12.statcan.gc.ca. Statistics Canada. 15 February 2019. ^ "Census Profile, 2016 Census: Iqaluit [Population centre], Nunavut and Baffin, Region [Census division], Nunavut". www12.statcan.gc.ca. Statistics Canada. 15 February 2019. Canada Year Book 1967 (PDF). Ottawa, Canada: Statistics Canada. 1967. pp. 57–63. Retrieved 6 March 2015. Iqaluit, meaning "place of fish", is the capital of the Canadian territory of Nunavut, its largest community, and its only city. It was known as Frobisher Bay from 1942 to 1987, after the large bay on the coast of which the city is situated, when the traditional Inuktitut name was restored. Yellowknife is the capital and only city, as well as the largest community, in the Northwest Territories, Canada. It is on the northern shore of Great Slave Lake, about 400 km (250 mi) south of the Arctic Circle, on the west side of Yellowknife Bay near the outlet of the Yellowknife River. Yellowknife and its surrounding water bodies were named after a local Dene tribe once known as the 'Copper Indians' or 'Yellowknife Indians', referred to locally as the Yellowknives Dene First Nation, who traded tools made from copper deposits near the Arctic Coast. Its population, which is ethnically mixed, was 19,569 in 2016. Of the eleven official languages of the Northwest Territories, five are spoken in significant numbers in Yellowknife: Dene Suline, Dogrib, South and North Slavey, English, and French. In the Dogrib language, the city is known as Sǫ̀mbak'è. 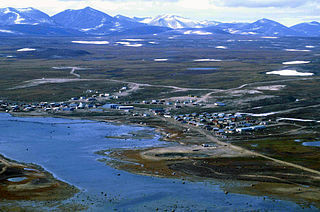 Nunavik comprises the northern third of the province of Quebec, Canada in Kativik, part of the Nord-du-Québec region. Covering a land area of 443,684.71 km2 (171,307.62 sq mi) north of the 55th parallel, it is the homeland of the Inuit of Quebec. Almost all of the 12,090 inhabitants of the region, of whom 90% are Inuit, live in fourteen northern villages on the coast of Nunavik and in the Cree reserved land (TC) of Whapmagoostui, near the northern village of Kuujjuarapik. Inuinnaqtun, is an indigenous Inuit language of Canada and a dialect of Inuvialuktun. It is related very closely to Inuktitut, and some scholars, such as Richard Condon, believe that Inuinnaqtun is more appropriately classified as a dialect of Inuktitut. The governments of the Northwest Territories and Nunavut recognise Inuinnaqtun as an official language in addition to Inuktitut. 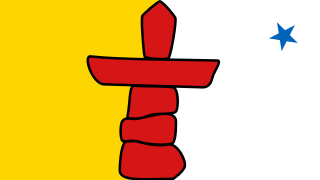 The Official Languages Act of Nunavut, passed by the Senate of Canada on June 11, 2009, recognized Inuinnaqtun as one of the official languages of Nunavut. Kitikmeot Region is an administrative region of Nunavut, Canada. It consists of the southern and eastern parts of Victoria Island with the adjacent part of the mainland as far as the Boothia Peninsula, together with King William Island and the southern portion of Prince of Wales Island. The regional seat is Cambridge Bay. Cambridge Bay is a hamlet located on Victoria Island in the Kitikmeot Region of Nunavut, Canada. It is named for Prince Adolphus, Duke of Cambridge, while the traditional Inuinnaqtun name for the area is Ikaluktuutiak or Iqaluktuttiaq meaning "good fishing place". Fort McPherson is a hamlet located in the Inuvik Region of the Northwest Territories, Canada. 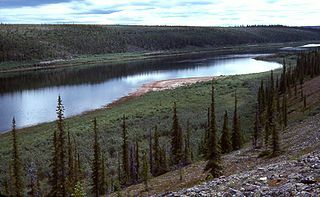 It is located on the east bank of the Peel River and is 121 km (75 mi) south of Inuvik on the Dempster Highway. Clyde River is an Inuit hamlet located on the shore of Baffin Island's Patricia Bay, off Clyde Inlet, an arm of Davis Strait in the Qikiqtaaluk Region, of Nunavut, Canada. It lies in the Baffin Mountains which in turn form part of the Arctic Cordillera mountain range. The community is served by air and by annual supply sealift. 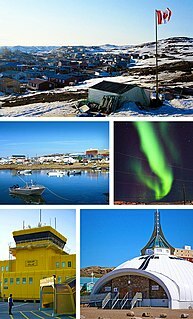 Bathurst Inlet,, is a small Inuit community located in Bathurst Inlet in the Kitikmeot Region of Nunavut, Canada. As of the 2016 census the population remained at zero. Nunavut is the newest, largest, and most northerly territory of Canada. 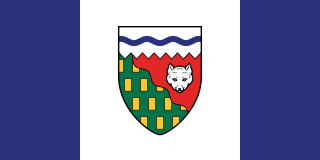 It was separated officially from the Northwest Territories on April 1, 1999, via the Nunavut Act and the Nunavut Land Claims Agreement Act, though the boundaries had been drawn in 1993. The creation of Nunavut resulted in the first major change to Canada's political map since the incorporation of the province of Newfoundland in 1949. The Northwest Territories is a territory in Northern Canada, specifically in Northwestern Canada between Yukon Territory and Nunavut including part of Victoria Island, Melville Island, and other islands on the western Arctic Archipelago. Originally a much wider territory enclosing most of central and northern Canada, the Northwest Territories was created in 1870 from the Hudson's Bay Company's holdings that were sold to Canada from 1869-1870. In addition, Alberta and Saskatchewan were formed from the territory in 1905. In 1999, it was divided again: the eastern portion became the new territory of Nunavut. Yellowknife stands as its largest city and capital. It has a population of 42,800 and has an area of 532,643 sq mi (1,379,540 km2). The current territory lies west of Nunavut, north of latitude 60° north, and east of Yukon. The Canadian Arctic tundra is a biogeographic designation for Northern Canada's terrain generally lying north of the tree line or boreal forest, that corresponds with the Scandinavian Alpine tundra to the east and the Siberian Arctic tundra to the west inside the circumpolar tundra belt of the Northern Hemisphere.